John James Abert was an United States Soldier. He headed the Corps of Topographical Engineers for 32 years during which time he organized the mapping of the American West. Abert graduated from West Point in 1811. After leaving West Point he married Ellen Matlack Stretch. 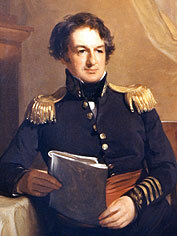 He rejoined the army as a topographical engineer in 1814. In 1829 he was promted to the leadership of the corps. Officers working under him were responsible for the exploration and mapping of the lands west of the Mississippi. Abert Rim in Oregon was named after him.